Continuing with the multi-part review of the new Codex: Craftworld Eldar, which has previously touched on fluff and aesthetics, HQ choices, the Wave Serpent changes, and the myriad Troops choices available to the Eldar. Here, I’m going to depart from the Force Organization chart a bit, and discuss Aspect Warriors particularly (save for the Dire Avengers, which got covered in the section on Troops. This is partially because they got some very significant changes, but also because in many formations (as we’ll see) it’s more relevant to be an Aspect Warrior than it is to be in whatever slot the unit happens to be in. Howling Banshees. First, the cost of Banshees dropped by 10 points for a unit of 5 and 2 points per additional Banshee, though the cost of an Exarch upgrade remains the same, though as noted, with War Shout baked in, which causes enemy units locked in combat with the Exarch to suffer a -2 to their leadership – of great benefit when talking about potentially breaking units (the Banshees don’t want to be stuck in for long) and running them down (the Exarch enjoys a very high initiative of 6). The unit retains Acrobatic, which allows them an extra 3″ to their run and charges, but additionally now allows them to ignore the initiative penalty to charging into cover, which was one of their great weaknesses in the last codex, and the fatal flaw of many Dark Eldar assault units. The Exarch can take an Executioner, which while two-handed gives her +2 S and AP2, which will allow the Banshees to fight out of the high T or 2+ armor save battles that represent a brick wall to their standard S3 AP3 attacks, a Triskele which grants her a S3 AP3 Assault 3 ranged attack while charging, which may be handy for taking out a model or two while coming into combat, or a pair of mirror swords, which makes her close combat attacks master-crafted at the expense of her shuriken pistol. There aren’t any glaringly poor choices, though in my opinion 10 points for the Mirrorswords is a dubious value at best. Covering another weakness that is crippling to Dark Eldar assault units like Wyches, each model is also equipped with a Banshee Mask, that prevents her unit from being fired on in Overwatch, as well as causing Fear. This is…a big deal, because in relatively small, fragile units and relying on not getting stuck in combat, taking a casualty or two from Overwatch can be potentially devastating. This is also useful in combined charges to protect other units that don’t have this power from taking fire as well. Howling Banshees can also take a Wave Serpent, though not being an assault transport, and not being able to pull off that same “Blow your enemy off a point with shuriken fire and then brace for counter attack” move that the Dire Avengers might be able to, the Wave Serpent is an odd choice. They’re probably better off running – if you have the proper cover for them – or mounting up in another Assault vehicle. The options for those I’ll be discussing toward the end of this series, looking at the Eldar as essentially a series of mutually compatible codexes. Striking Scorpions. Remaining the same cost as previous, the Exarch gets Stalker built in, which allows him to make an extra attack in the first round of a challenge for each point his Initiative is higher than his opponents. Versus low I opponents, this is really nasty, and even against most Space Marine characters, it’s an extra attack, meaning likely 5 attacks on the charge, probably hitting first. The whole unit also comes equipped with Mandiblasters, which have also changed. At Initiative 10, each model rolls a d6. On a 4+ (6+ vs. Gargantuan creatures), an enemy model takes a wound. Definitely a source of a nice bonus wound or two that potentially skews the battle before it’s even begun. Unlike the Howling Banshees, the Striking Scorpions have a pretty clear delivery system, in the form of Infiltrate and Scout, as well as having Shrouded as long as they haven’t attacked or fired yet, meaning a potential 2+ cover save in addition to their 3+ armor save, starting up close to their foes, and enjoying fleet to get themselves forward into battle. They too can take a Wave Serpent, but really…why? The unit does however struggle with armored troops, the Scorpion Chainsword being only +1 S and AP6, putting them basically on even footing with an Assault Marine once the Mandiblasters have done their work. The Exarch can swap out for a Biting Blade, which adds +2 S and AP 4, though at the expense of being two-handed. Giving up the Exarch’s pistol as well can also get you a pair of Chainblades, at +1S, AP5 and Rending, which definitely has potential. Both however pale, in my mind, with the Scorpion’s Claw, which makes the Exarch’s attacks S6 and AP2. Expensive, to be sure, but an at-initative power fist and that mountain of attacks? Definitely worthwhile. Fire Dragons. Same price as they once were, the Exarch now having Crack Shot, which allows him to re-roll one failed To Hit, To Wound, or Armor Penetration roll. Given the historical use of the Fire Dragons as a one-hit wonder, coming down, popping a high value tank and then dying horribly in retaliation, it’s a nice power to have, making sure that single shock-and-awe attack goes off is important. Combine this with the unit-wide Assured Destruction rule, which adds a +1 modifier to the Vehicle Damage table, tanks should definitely live in fear of this unit, though in melta range being at 4+ to Explode! seems like, well, a little overkill. But it’s icing on the cake. They retain Fleet and Battle Focus which should let them get into melta range fairly easily. The Exarch cam take a Firepike, potentially useful if you’re worried about being in range to make sure someone is in range, or a Dragon’s Breath Flamer. Which to my mind is pretty much a trap – it’s doing something utterly contrary to the rest of the unit, and any open-topped, low armor transport is better dealt with by other units. Unlike the Banshees or Scorpions, there is some call for the Fire Dragons to take their Wave Serpent, getting themselves into position to fire, as they won’t be doing much in the way of assault. It is a survivable way to go, though being a dedicated anti-tank unit that comes in pretty small units, there’s also a case to be made for having them ride in a Falcon, which will also lay down longer ranged anti-tank firepower. Swooping Hawks. This is a unit that I look forward to getting good every time a Codex is released, and it seems that it might actually have gotten there this edition. Remarkably for an Aspect unit, they actually seem to be a decent multi-purpose unit. Able to deep strike, and with their Exarch’s Herald of Victory power that lets them come in without error, they’ll begin with a 24″ S4 AP4 Barrage, Ignores Cover attack that doesn’t need line of sight, either as a blast (5 models) or a large blast (6+ models). That’s a nice entrance, and once they’re down they’ll remain mobile, able to move 18″ or Skyleap which lets them enter ongoing reserve. Armed with Lasblasters, which are S3 AP5 and Assault 3, Swooping Hawks can absolutely scythe down weak troops like Fire Warriors or Imperial Guard troops. Also armed with Haywire grenades, they can also strip a few hull points off a vehicle in a pinch. The Exarch can also take a Hawk’s Talon, which is a S5 AP5 Assault 3 version of the Lasblaster, or a Sunrifle, which is S3 AP3 and Blind, both of which are suited for different tasks and probably viable choices depending on your likely foes. The Exarch can also take a power sword, but I wouldn’t bother – if you’ve gotten into close combat where you really want an AP3 attack, things have already gone south and it’s time to cut your losses. 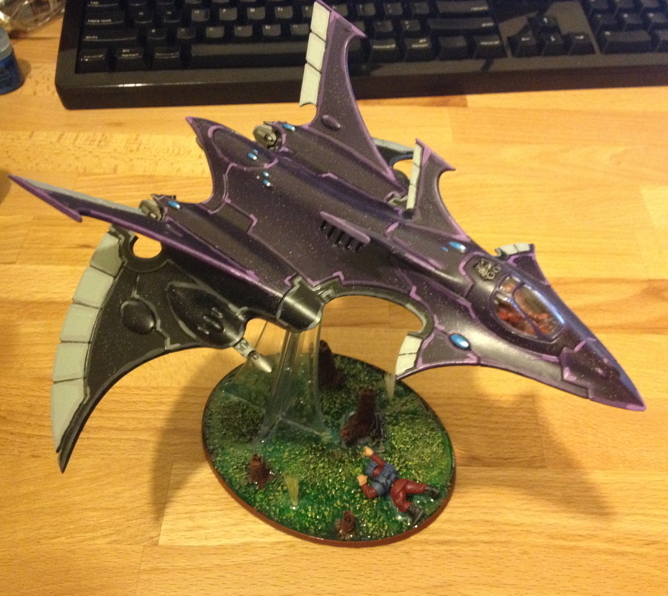 Finally, they even have a means to tackle fliers, which emerges from the idea I mentioned previously – someone on the Codex team really likes the Eldar fluff. Swooping Hawks aren’t just jump troops. They’re aerial warriors just as comfortable at altitude as any fighter pilot. To whit, each model can make an attack against an enemy flier or flying monstrous creature they moved over on their turn. That attack hits on a 4+ and is resolved at S4 AP4 and Haywire, striking fliers on their side armor. That’s definitely dangerous, though I think more dangerous to flier than flying monstrous creatures. The Swooping Hawks definitely do a lot. They are still however pretty fragile, 16 pt/model units, and a lot of their abilities are highly situational. They’re hardly a point-and-click unit, in an army that admittedly has a fair number of those. But in the right hands, they can be a hugely disruptive. Warp Spiders. Still their marvelously fast moving, hard hitting selves. The warp jump generator has changed, letting you move either as Jet Pack Infantry or make a 2d6+6″ move in any direction ignoring terrain, other models, etc. that are in the way. This used to be far more dangerous, but now one member of the unit is lost as a casualty only when double 1’s are rolled. This is in addition to their Battle Focus run, making them stupidly mobile. The Exarch’s Iron Resolve ability means they pass Pinning, Fear, Regroup and Morale checks, which should keep them moving as well under almost any circumstance. It gets even better – the unit now has a special rule called Flickerjump. When this unit is chosen as the target of a shooting attack, it can immediately make a Warp Jump so long as it isn’t Falling Back, moving 2d6″, at the cost of not being able to make a Warp Jump next turn. Which yes, means if you take fire, you can just disappear and potentially move out of range, out of LoS, etc., ruining that unit’s shot. Additionally, units assaulting a group of Warp Spiders will now have to think long and hard about shooting them beforehand – it will now be trivially easy for them to be carried out of assault range. But what do they do beyond extreme movement shenanigans? They fire their Deathspinners, which are S6, and when rolling To Wound, they use Initiative rather than Toughness, and AP2 on a roll of 6. Somewhere, a Tau Battlesuit weeps. That being said, they no longer have a bonus to Armor Penetration rolls, so their anti-vehicle firepower is pretty lacking. The Exarch can take either a twin-linked version of the same weapon, or a Spinneret Rifle, which is S6 AP1 Rapid Fire, with the same Monofilament rule targeting Initiative. The latter needs to get close, as it only has a 18″ range, meaning 2 shots requires being within 9″. For former is dirt cheap, but with a BS of 5, probably not essential. Finally, the Exarch can take a pricey (20 pts) paid of powerblades, which thankfully do not involve sacrificing their gun. These are just standard power swords, but with high mobility and Hit and Run, they may be useful for finishing off a unit, or killing off a character in challenge with a power weapon of their own (a threat to the Warp Spiders at T3 and 3+ armor). Given how mobile they are however, they should largely be dictating whether or not they’re in combat, and I’d think they’d prefer to stay out of it. Shining Spears. Now the natural place to tuck a combat-oriented Jetbike-mounted Autarch, Shining Spears were a little disappointing in the last Codex. They were very much a unit dependent on shattering their foes in a single turn of combat, and that’s really not how close combat in this edition works, especially not with such small units. Sadly, they’re not cheaper. They are a little more survivable in the face of AP3 firepower (important at 25 points a piece), as they have a 4+ cover save as long as they’ve moved. With skilled rider, they can also take a 3+ cover save if they Jink. The Exarch’s built-in power is Expert Hunter, which allows re-rolling of failed To Wound roles versus Monstrous Creatures and re-rolled armor penetration rolls. This adds a little bit of extra hit, but not as game-changing as some of the other powers. They lack Hit and Run, which is unfortunate, because like Fire Dragons, Shining Spears are mostly a weapon delivery system – specifically, their Laser lance, which is a S6 AP3 Assault 1 Lance with a 6″ range when shooting, and a S6 AP3 Lance weapon when charging. That will ruin someone’s day, to be sure. In the previous edition, they were crippled down to a S3 AP – weapon in later turns, while in this edition they at least retain their AP3 value, making them not entirely useless when they get stuck into combat. The Exarch can upgrade to a Power Weapon (don’t do this, it’s a trap and manifestly worse in every respect), or a Star Lance, which bumps the Laser lance’s stats up to S8 and AP2 – definitely a nice extra edge. Note however that, unlike most aspects, they aren’t armed with pistols – they’ll only be doing 1 attack base, 2 on the charge (2 and 3 respectively for the Exarch). All in all, they definitely got better (being not useless in all but the first round of combat), but they’re still very expensive, weak in those subsequent rounds, and I don’t think quite equipped enough to shred what they hit, which is really what they need to do. I’m afraid this is not yet the age of the Shining Spear, especially as there are alternative close-combat jetbikes to be had from other Eldar books. Dark Reapers. Dark Reapers took a substantial discount in terms of their points cost, which is nice, as nasty as they are they’re still a small T3 3+ unit. Equipped with S5 AP3 Heavy 2 missiles, with the option to also take S8 AP3 Heavy 1 missiles for 8 pts., they definitely dish out a lot of firepower. The Reaper rangefinder prevents Jink saves, and the unit now has the Inescapable Accuracy rule, which allows re-rolls to To Hit against Zooming, Swooping, Turbo-boosting or Flat Outing (is that a word?) units. The big one is Zooming and Swooping – that means that while the Reapers are still snap-firing, they’re doing so as effectively twin-linked, and any hits they make aren’t going to be saved via Jink. It’s a curious way to build an anti-air unit, but very likely an effective one. Slow and purposeful means no running and thus no Battle Focus for them, but in exchange they can fire their heavy guns on the move. The Dark Reaper Exarch comes with a series of potential upgrades. First, they have Fast Shot built in, meaning they take one more attack than their gun would normally allow (i.e. a Heavy 1 weapon does two shots). They can also swap out for a Shuriken Cannon (the times you should do this are vanishingly rare), a Tempest Launcher which is a 36″ range S4 AP3 Heavy 2 Barrage Blast anti-infantry weapon (though you lose their impromptu AA abilities) or an Eldar missile launcher, which is a glorious all-rounder, firing 48″ S4 AP4 Heavy 1 Blasts or S8 AP3 Heavy 1 shots, or S7 AP4 Heavy 1 Skyfire missiles. Spendy, but potentially useful. The latter I think I question somewhat – the Eldar army has a lot of potential AA within it, the standard Reapers do impromptu AA well enough anyway, and stuff that needs a S4 AP4 Blast is probably better handled with the masses of middling-high Strength firepower coming out of other parts of the army. Barrage is always fun though. Wave Serpents are again an option here, but not one I would take unless you’re expecting to go up against a seriously alpha-strike heavy list, like Deathwing (at which point you should be less than terrified…), drop pod heavy Space Marines, or another army that may kill your Dark Reapers off in a single round of shooting. In that case, the Wave Serpent can be a helpful, if pricey, bus in which to keep them safe. But my fannish adoration for them aside, are they any good? Last edition, while acknowledged as deadly anti-air fighters, they were widely regarded as overcosted glass cannons, and for good reason. The good news is they did a little bit about the cost, discounting them a full 20 points below their previous price. The Exarch upgrade remains the same, but again comes with the Marksman’s Eye power built-in, which allows them to make Precision Shots on a 5+. I’m going to come out and say that this is something of a dubious power – Crimson Hunters are anti-vehicle generally and anti-flier specifically in their loadout. Precision shots will come up very rarely with either one of those (picking out a unit in a squadron? Maybe targeting a Tyranid flier hiding with packs of Gargoyles?) which means where it mainly comes into play is when making strafing runs versus infantry units. There it is handy, but not what the Crimson Hunter should be doing. The Exarch can also swap out their Bright Lances for Starcannons, which is, in my mind, pretty questionable, and again building up an anti-infantry fighter out of a anti-vehicle flier. The Crimson Hunter is still a superior dogfighter, thanks to Vector Dancer giving them insane maneuverability and Skyhunter, which lets them reroll failed armor-pens against fliers (but not wounds vs. flying monstrous creatures). With S8 AP2 weapons, those hits are going to hurt. They’re still definitely glass cannons though, at AV 10 all around. So there we have it, the end of the Aspect Warriors. All in all, they got better. In store for later are some formations that take them from “better” to “really good”. The last edition saw very little in the way of Aspect Warriors, and I’m hoping that’ll change this edition. Some of them will still struggle (Banshees still need a delivery mechanism, Shining Spears are still eye-bleedingly expensive) but have a place, and some have gotten genuinely interesting (Swooping Hawks, Warp Spider hijinks…). Enjoy what you read? Enjoyed that it was ad free? Both of those things are courtesy of our generous Patreon supporters. If you’d like more quantitatively driven, positive writing on 40K and miniatures wargaming, please consider joining them.